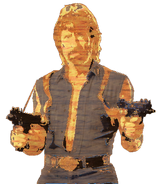 Chuck Norris has a wood grain pattern, thus "wood Chuck," and there's an array of wood, and Chuck vs wood. The amount of wood a wood Chuck would chuck. It is logging for the logging, so to speak. It looks like 4 in this case, but I'm not completely sure since x is never instantiated. Not the answer you're looking for? Browse other questions tagged visual rebus computer-puzzle or ask your own question. What word does this photo of a mouse represent?